CyborgWorks brings to us Cooking Master Dash, a wonderfully delicious game that lets you come up with all the food items you can possibly think of! 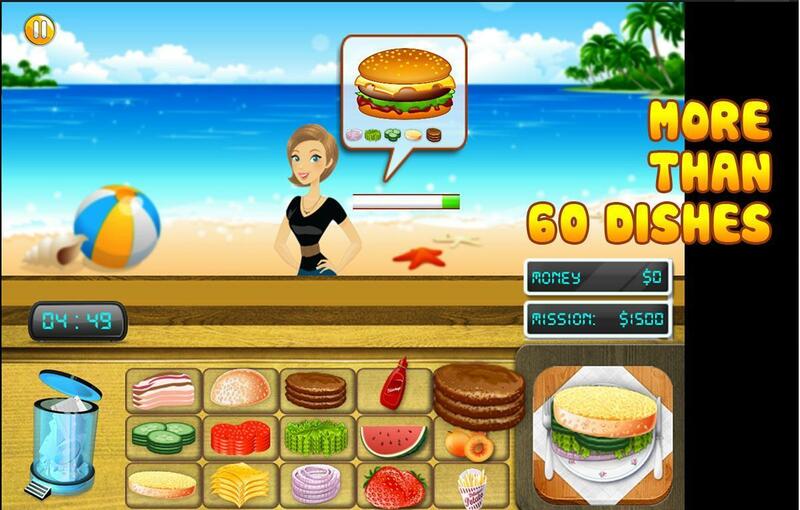 In this exciting cooking game you are put in the front lines of a diner to serve paying customers according to their orders inside a fast paced environment. This is an opportunity for serious food addicts to sharpen your skills as you prepare, cook and assemble the most delicious menu. Dash your way around the kitchen and make special recipes to keep your customers coming back for more. So get your knifes sharpened and keep your apron on at all times as you take a crazy food adventure with Cooking Master Dash! Cooking Master Dash starts off well and truly into the game, being easy enough to play without having the need for a tutorial. 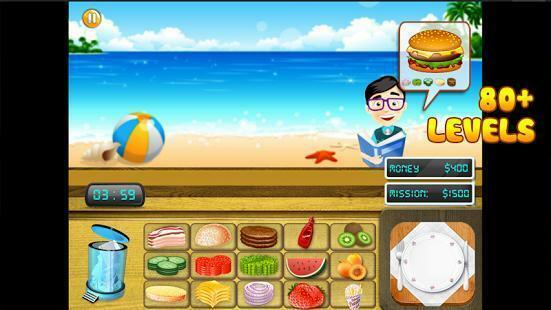 The game screen immediately shows the player three different sections mainly the variety of ingredients available, the serving plate and the trash bin all of which serve a purpose. Every few seconds, the line of customers pop out and will all be requesting some sort of meal represented by an image of that dish. Players must keep up with the demands of the customers or risk having that customer walk away. But satisfy the customer through accurately placing ingredients in their meal before their patience runs out will earn you some money. The aim of the game is to serve up as many successful meals to the customers to earn the mission for the day which is represented in cash. Players must work as fast and as efficiently as they can since there is a time limit in every level. Furthermore, different customers will have different levels of patience so depending on who has less, the player should adjust accordingly to meet as many orders as they can. Alternatively, players can also choose to serve customers who order meals which involve less ingredients to get through the orders quicker. The more orders fulfilled correctly, the more money you can earn within the designated time given during a level. Should you plate up a wrong combination of ingredients, there is always the trash bin to get rid of unwanted food and start plating up again. 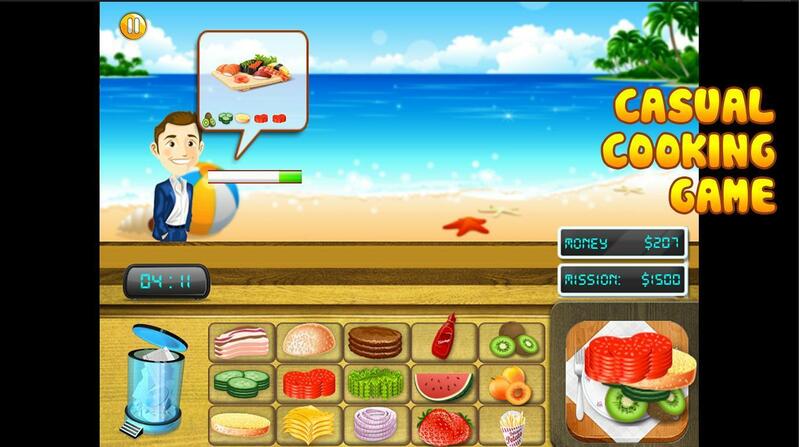 The graphics used in Cooking Master Dash are quite simple yet distinctive and colorful, the use of great backgrounds also give off an authentic dining or take out experience. The music used is also relaxing and doesn’t add stress to the fast paced hustle of the game. So while serving customer their favorite foods, you can ensure to enjoy your kitchen hand experience. All in all, Cooking Master Dash is an exciting cooking game that presents a great challenge to both fans and newbies of the cooking genre. With more than 40 various customers that have different looks and personalities as well as a whopping 60+ recipes to prepare and cook, there is endless fun in being a chef and restaurant owner. But always be on your toes as the customers and the orders pile up in front of you, it becomes a race against time to make your earnings. So get ready to have the biggest cook off and food service of your life in Facebook’s hottest cooking game, Cooking Master Dash!